Tomorrow morning I’ll running the Clarendon Day 10k in Arlington. This will be my second year running this race (I first ran it last year). Though I contemplated signing up for the Clarendon Day Double this year (5k followed by the 10k, similar to what I did back in March for the St. Patrick’s Day Double), I decided that at 27 weeks pregnant that a double race was not in my best interest. 1. This will be my 13th race of the year. I’m still on my quest to complete 15 races this year. My 14th race will be Rock ‘n’ Roll Philly, but my 15th race still remains undecided. 2. The course is a net downhill. The majority of the downhill occurs during the first 1.5 miles of the race, after which the course has slight elevation increases and decreases. 3. Preston will be there to support me. When I initially signed up for this race, he had other plans on his calendar for the morning. However, those plans have since fallen through, so now he’ll join me in Arlington to cheer me on during the race. 4. 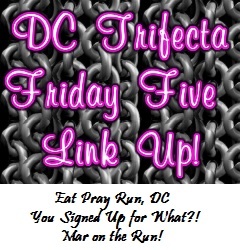 Several other DC area bloggers will also be running this race. I know that both Courtney and Jenny will be there. And I feel like a couple of others also told me that they’d be there but I honestly can’t remember who! 5. It’ll likely be the last race I run before our little guy’s arrival. Running is becoming progressively more difficult and I’ll be seriously evaluating how much more I’ll be running, if at all, after tomorrow’s race. Some days running goes fine and is completely pain free, while other days are a completely different story. QOTD: What race is next on your calendar? What about the race are you looking forward to? Also, if you haven’t entered my SmartyPants Vitamins Giveaway, be sure to do so! The giveaway runs until September 30, 2015 at 11:59 pm EST. This entry was posted in Training and tagged 10K, 15 in 2015, Clarendon Day 10k, fit pregnancy, Friday Five, goal, goal setting. Bookmark the permalink. I’m excited for this course 🙂 Looking forward to seeing you again! This is such a popular race! I didn’t sign up b/c I was going to do the Reston 10 Miler Sunday, but I had to drop b/c of a business trip. I hope it’s a great “last race” for you. Thanks! I’m glad that we had great weather for yesterday’s race. 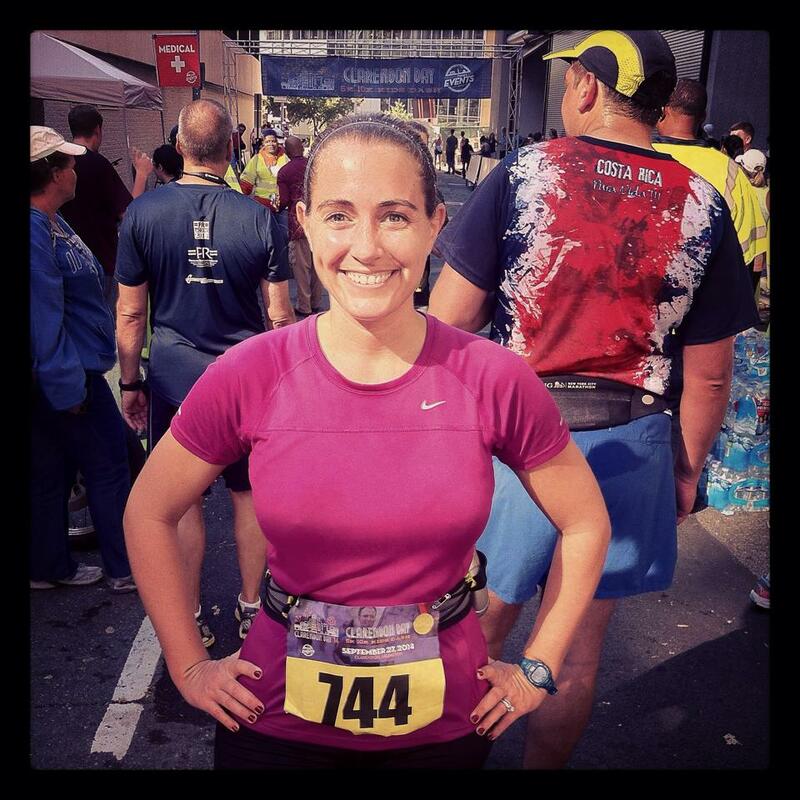 My next race is the Poland Spring Marathon Kickoff October 26th, it’s #7 of my 9 to qualify for NYCM next year! A net downhill and support squad both sound great, you’ll do amazing! I hope you have a great race Kathryn!!! My next race is the Gulf Coast Half Marathon in Mandeville, LA in October! And I know that you’ll be well prepared for your half next month. Your training has been going so well! I hope to see you tomorrow! have a great race!! So great to finally meet you yesterday! Have a great race! Net downhill is my kind of course! I’m looking forward to having my marathon out of the way (in 9 days!) and most excited to have fun at RnR Vegas! RnR Vegas is on my bucket list. It’s no wonder your looking forward to this race too, downhill how awesome is that! Good luck and have fun! Love the pictures of all of yall! That’s nice that it worked out that Preston can come support you for this race now. 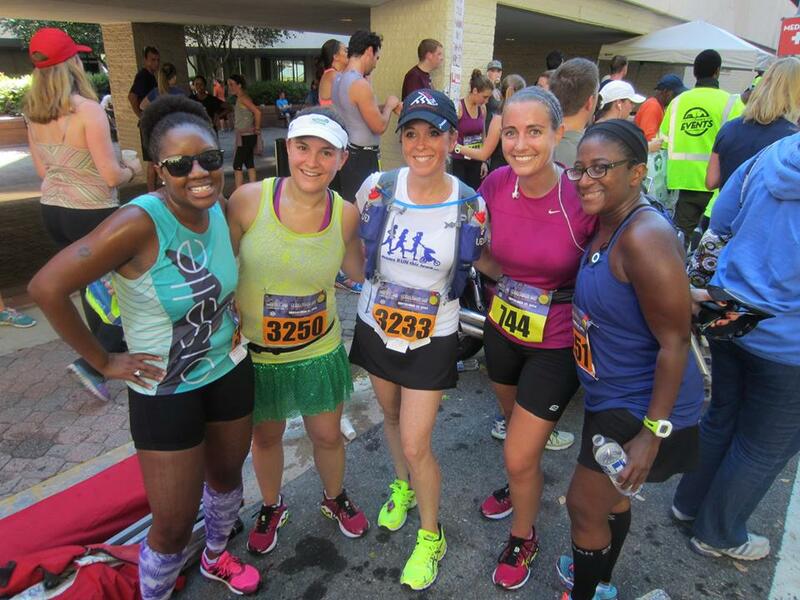 It’s always fun seeing other runners/bloggers that you connect w at races. Feels like your not running it alone. Good luck! You’ve been doing a great job keeping up with running while pregnant. You have done so many races this year! Really impressive. I did the double last year it’s tough to do as you also have to walk back from the finish to start line in between. Which is also why the St. Patrick’s Day Double is much more runner friendly. You finish the 5k at the start line for the 10k. Sounds like a fun race, have a great time! Crazy to think it could be your last race before you become a super awesome running mama. 😉 Enjoy it! Good luck in your race! Sounds like fun. My next race is the Honolulu Marathon in December, though I may do the Tram Road Race in October (3.7 miles almost straight up, which just happens to be the race that I first met, then three years later, married my husband at). Have fun ! Hope the weather and conditions are great. That elevation chart looks heavenly! Have fun! Hope you had a great race Kathryn. I would love to do that one with that elevation….looks like a perfect PR course. It sounded like there were lots of PRs yesterday. Hope the race went well!! I love that this course doesn’t have much elevation to it! I’m going to be in the same boat as you are for RnR NOLA….I’ll be around 33 weeks and am not quite sure what to do! Definitely listen to your body. That’s what I’ll be doing in these last couple of weeks leading up to RnR Philly. So bummed I couldn’t be there today! Hope you had a great race! The last race before your little guy arrives. That’s monumental considering how much your running life will change. Not in a bad way. Just different.